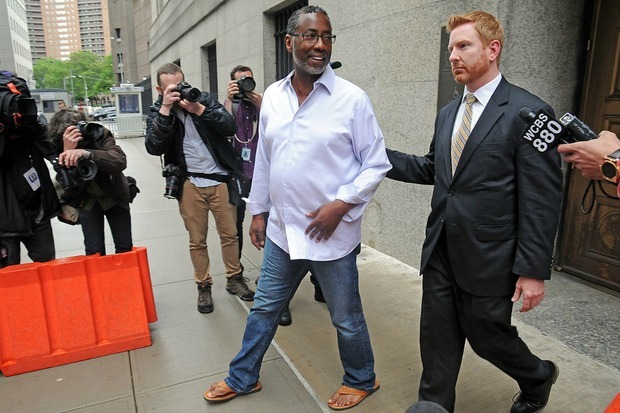 Correction Officers Benevolent Association Norman Seabrook, sporting flip-flops, smiles as he gets out of court after being arraigned on federal corruption and fraud charges. NEW YORK CITY — The head of the city's correction officers' union was arrested Wednesday morning in an ongoing federal probe into the NYPD and City Hall for his part in a yearslong fraud scheme involving wire-tapped phone calls and bribes delivered in expensive Ferragamo bags, federal law enforcement authorities said. Norman Seabrook, president of the Correction Officers’ Benevolent Association, personally got tens of thousands of dollars in kickbacks for steering about $20 million in union money to the Platinum Partners hedge fund in a scheme dating back to December 2013, according to the U.S. Attorney's office. Seabrook met Manhattan-based hedge fund manager Murray Huberfeld through a mutual friend, Jona Rechnitz, designated as "CW-1" in court papers, according to officials and sources. Seabrook and Huberfeld, both of whom were arrested about 6 a.m. Wednesday in their respective homes, were charged with conspiracy to commit honest services wire fraud and honest services fraud, sources said. Rechnitz, a real estate mogul being investigated for the $35,000 he raised for Mayor Bill de Blasio's Campaign for One New York, pleaded guilty to fraud in hopes he might get some leniency when he's sentenced, federal prosecutors said. Wearing flip-flops, jeans and an untucked dress shirt, Seabrook told reporters, "I feel like a million dollars" after his arraignment Wednesday afternoon. He was released on $250,000 bail. Seabrook, who has worked as a correction officer since 1985, traveled to the Dominican Republic with Rechnitz in late 2013 and confided in him during a night of drinking that he wanted to get bribed to invest his union's money, prosecutors said. "[It's time that] Norman Seabrook got paid," Seabrook said, according to the complaint against him. Rechnitz acted as an intermediary between Seabrook and Huberfeld, relaying terms of the deal and eventually carrying kickbacks to the union boss, prosecutors said. "How much is Norman Seabrook going to get paid?" Seabrook asked Rechnitz, who told him that he could net up to $150,000 depending on the hedge fund's profit. In one kickback payment on Dec. 11, 2014, Rechnitz went to Seabrook's favorite luxury goods store in Manhattan, Salvatore Ferragamo and bought an $820 bag, prosecutors said. He filled it with $60,000 and brought it to Seabrook who was only a couple blocks away, feds said. Seabrook became enraged when Rechnitz told him how much was inside because he didn't think it was enough, according to an affidavit from FBI Special Agent Blaire Toleman contained in Seabrook's federal complaint. The trio hoped to hide the bribes by drafting fake invoices showing that Huberfeld's hedge fund paid Rechnitz for his season tickets to the Knicks, Toleman said. "At the time of this supposed payment of $7,500 per game, the New York Knicks' record was 4-20," the complaint against Seabrook reads. Huberfeld's fund never got the Knicks tickets, prosecutors also noted. Between January and May 2015, FBI investigators recorded phone calls between Huberfeld and Rechnitz's embattled partner Jeremy Reichberg, who also raised $35,000 for the mayor's nonprofit and allegedly wooed NYPD officers with lavish trips. Reichberg was identified in Seabrook's federal complaint as co-conspirator-1 or CC-1 who boasted, "I have the right connections and I might as well use mine." Huberfeld would sometimes refer to money as "gelt" and "pressured" Reichberg to convince Seabrook to invest more union dollars in his hedge fund, prosecutors said. "What are we doing about getting Murray more money," Huberfeld asked Reichberg, referring to himself in the third person. Huberfeld wanted more COBA investments because other clients kept withdrawing as much as $44 million from the hedge fund, prosecutors said. But Seabrook couldn't invest more money because he was having some of his own internal problems, prosecutors said. A former union board member, whom Seabook had fired, was suing him for violating union rules and improperly investing in Huberfeld's Platinum fund. "There's no money now [because of an] internal problem with a guy," Rechnitz told Reichberg. After the union boss's arraignment Wednesday afternoon, his lawyer, Paul Shechtman, disparaged the prosecutor's case and vowed take the charges to trial. "Norman Seabrook has spent his entire life fighting," Shechtman, a former federal prosecutor, said. "He's not going to walk away from a fight. This is a one witness case. This witness has a lot of baggage." The lawyer also took the opportunity to bash the Knicks. "The only corroboration seems to be no one would pay $60,000 for Knicks tickets," Shechtman said. Seabrook, who still works for the city's Department of Correction, will be suspended from that post, Mayor Bill de Blasio said at press conference Wednesday morning. "These are allegations, but I'll say this: if proven true, it's disgusting and it's very, very sad. It means he stole money from his own workers. That's what it comes down to," the mayor said. De Blasio said he's had a "very fraught" relationship with Seabrook, particularly over reforms the mayor wanted to make to Rikers Island. "I just want to offer my thoughts to the people who work at Rikers and work in our Department of Correction," the mayor said. "We are going to continue to effectively change the work we do, improve it, reform it. We're going to get past this moment and move forward," he added. Refresh this page for further updates.